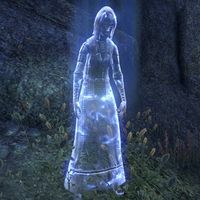 Idrasa is a Dunmer spirit found at Malak's Maw. She seeks revenge against her killer, Khralek gro-Vortag, an Orc necromancer found at the stronghold located in the area. "You can see me, outsider! I beg you, help me." "My followers and I came here to investigate a great magical disturbance. We were ambushed and fallen upon by Khralek gro-Vortag, an Orc necromancer. We were captured. We were beheaded." "Khralek used some foul necromancy to bind our souls to our skulls. Mine sits upon his dark altar. The skulls of my followers were spread among the Orcs, their souls to be used as slaves. He tortures us and torments us endlessly." I will reclaim the skulls. Find the skulls and bring them to Khralek's altar. We may be dead, but we still have power. We can pull Khralek to you." May I ask a few things? Other than Khralek, you're the first person I've spoken to since... the beheading." "I am—was—a priestess of the Tribunal. I came here with a group of six other priests to seek the source of a terrible spiritual disturbance. What we found was horror." "Khralek gro-Vortag practicing terrible necromancy in this land. He studies a new art to bind the souls of the dead to morbid fetishes. We became his latest experiment." Why can't I just take or destroy your skull? "Khralek is cunning, for an Orc. The spell can't be broken as simply as that. Killing him is the only sure way." "Khralek is dead and our spirits are free." "We are free! Go in peace with our blessing." This page was last modified on 9 February 2019, at 02:15.